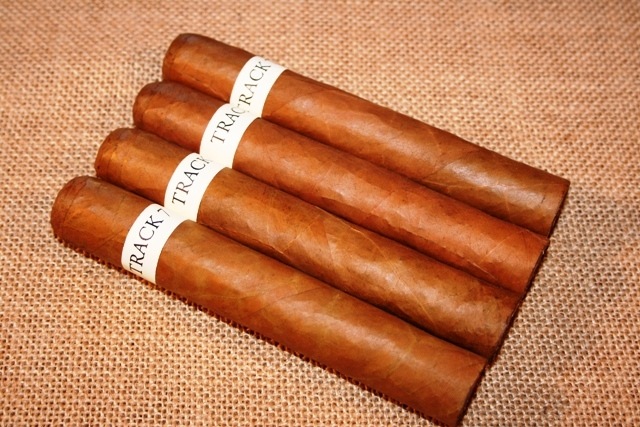 A new Track 7 cigar by Flatbed Cigar Company. A beautiful Connecticut Sun Grown wrapper. Filler is: 2 Dominican Ligero's and Seco Cubano. Also...Nicaraguan Ligero, and some Kentucky Fire cured too! A full bodied, full flavored cigar in the popular 6x60 size. This blend has a sweat smokey-ness with hints of chocolate, coffee, and walnuts. Note; the body (amount of smoke) is very full, but the "strength" is medium, to medium strong. A very enjoyable cigar anytime of day. A truly beautiful looking cigar with that Connecticut grown wrapper. Try a 4 pack of theses awesome 6x60s. Ships in lined burlap bag with Humi Pak enclosed. Great taste!! Very smooth!! Awesome taste!! and burns very well!! I highly recommend!! Track 7 is everything and more of your description. I might add the construction and burn is impeccable. Well done Flatbed!!! If u get the chance try these out. Off the hook!!! Nutty,creamy,on and on. Excel. Stick. Good job Paul.